Sharing the challenges—and triumphs—of living with arthritis can help empower others with the disease, so Arthritis Consumer Experts (ACE) asked people to submit their story of living with arthritis. It was a warm, sunny day when I dove into the bottom of a swimming pool and snapped both my wrists back. It didn’t really hurt, just kind of stunned me that I was that close to the bottom. I was six years old. Six months later, I was in the hospital getting all kinds of tests each day so the doctors could find out what was causing the mysterious swelling on my hands and ankles. The first time they came at me with a needle, I ran as fast as I could from them. It took seven nurses holding me down to take my blood. While my family and I waited for a diagnosis, the swelling rapidly progressed to the point I could no longer walk. Finally, after a month and a half, the doctors determined I had juvenile rheumatoid arthritis (also known as juvenile idiopathic arthritis). Aspirin and oral gold were my main treatments, which made me dizzy most of the time. I endured the teasing of bullies because of the visible joint damage, but I got their respect when it came to artwork. I was put in a special class because the regular class wasn’t challenging. The disease raged until I was eleven and then went into remission. In my twenties, I had a heavy lifting factory job in the early daytime and a confectionery job at nights and weekends. I was earning money and feeling good. I took karate every night I could. Then one day, my fingers started to hurt. At first, I thought I had sprained them, but then my shoulders and knees started to hurt. I went to see my family doctor and one blood test confirmed it: I had full blown rheumatoid arthritis (RA). My life as I knew it was over at age twenty-four. My doctor quickly referred me to a specialist. The disease rapidly progressed, this time affecting my shoulders, knees, elbows, and hands. One morning, I injured my back struggling to get out of bed. I was admitted to the hospital’s rheumatoid arthritis unit immediately. There I spent the days getting ice packs on all my joints, having my hands dunked into ice water, then warm, and doing physiotherapy. I went from being unable to walk, to walking two blocks. Those physiotherapists kept me out of a wheelchair, for which will I be eternally grateful. Full of regrets and bitterness, I became a couch potato. I ate all the comfort food and junk food I felt like and so I gained weight. After a battle with the insurance companies and Canada Pension Plan that lasted a year, I was put on permanent disability. The damage to my hands made it too difficult to work. I can only type with two usable fingers. When the disease settled down and I could get around on a scooter, I tried university. As a mature student with bad study habits, I quickly found myself swamped. After two and a half years, facing tough exams, I developed severe iron deficiency anaemia, a side effect of RA. Apparently stress causes it, so I had to give up on school. Once again I was back to being a couch potato, but this time I was somewhat active. I still liked exercise and so I took aqua fit classes whenever I could and bought an elliptical, which was a great low impact alternative when I found it too painful to walk. I joined a weight loss centre, but they went out of business just when I reached my optimal weight. With no way to buy all the supplements and things they required—it was a very restrictive diet—I went back to my old ways and gradually regained the weight. In 1998, my surgeon told me to lose the weight or he wouldn’t give me the right total knee replacement I desperately needed. This time, I managed to lose the weight on my own, simply by cutting out a lot of the junk, including giving up pop entirely. Over the years, I have had several surgeries: two total knee replacements, total replacements of both elbows, Dwyers procedure on both feet, and a recent re-do on one foot. I have had lung surgery, operations on my ears, an appendectomy, and numerous minor surgeries. Right now, I am on the urgent wait list for a hip replacement, but it is expected a year will go by before I get called in. I was also diagnosed with severe osteoporosis. The more my body tries to bring me down, the harder I try to come back stronger than before. Exercise is my drug of choice. Now, I am in the best physical condition of my life. I work out at a gym and I take high impact cardio classes two hours a day, six days a week. I never feel better than when I am moving and grooving to my advanced kickboxing, step and Zumba classes! I have maintained my weight for the last two years, by keeping careful track of my food intake and making sure I am burning enough calories to cover what I eat. An online website I discovered makes this easy. I walk everywhere I go and take long walks and hikes on our city’s river trails, going as much as five miles in two hours! 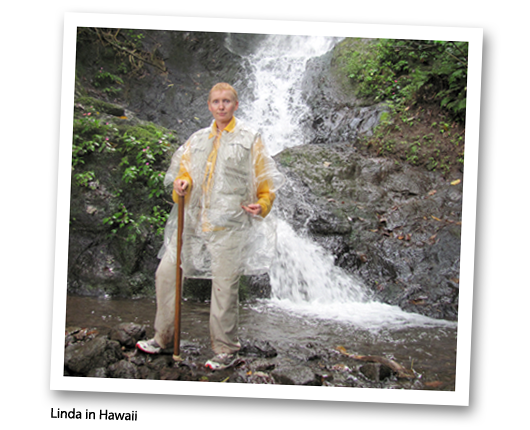 When I traveled to Hawaii I was able to go hiking in the rain forests for hours at a time. I have come a long way from my couch potato days. I no longer watch TV. I am the manager for a busy bridge club. There is computer work, but I can take my time doing things, just as long as I get them done in the time needed. It is just right for someone with a disability of the hands. I am a 49 year old woman, just trying to stay out of a wheelchair and live life to the fullest, in spite of severe RA, osteoarthritis, insomnia and allergies. I live alone, but have the wonderful support of my mother, who has always looked after me during my numerous surgical recoveries. 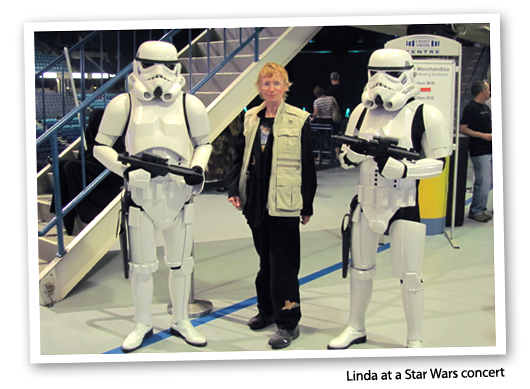 Since Linda originally submitted her story, she was able to get her much needed right total hip replacement before Christmas, due to a cancellation. She is rapidly recovering and was able to return to her bridge club activities within two weeks of surgery. Congratulations, Linda! I have rheumatoid arthritis. Thanks to a few very exceptional physicians and early aggressive treatment, my disease is in full remission (with medication). I experienced my first symptoms in July 2005. Out of the blue, both knees started to hurt. Two weeks later, both elbows started to ache. I was 31 years old and just about to go back to work full-time after maternity leave. My husband (an emergency physician) urged me to see my family doctor right away. Within weeks of my first symptom, I had seen my family doctor and had a referral to a rheumatologist. It was a four month wait for my first rheumatologist appointment (January 2006). At this appointment, I was diagnosed with inflammatory arthritis. My knees, elbows, ankles, feet, toes, wrists and the large joints at the base of the fingers were affected; my middle finger joints were still okay. I was booked for a follow-up appointment in nine months. In the meantime, this first rheumatologist recommended I continue to take ibuprofen as my sole treatment strategy. By my next appointment in Sept 2006 (14 months after my first symptoms), I had more than 30 affected joints, extended morning stiffness (it took until the afternoon to get anything working), and significant pain (I “maxed out” on daily ibuprofen by early afternoon). I had also lost 30 pounds. This time, the rheumatologist diagnosed my condition as rheumatoid arthritis (RA). Interestingly, her treatment plan was UNCHANGED: continue taking only ibuprofen as long as I could stand it. Her opinion was that we should save more aggressive therapy until absolutely necessary. She advised that, since rheumatoid arthritis is a chronic disease, you don’t want to waste the most powerful drugs at the outset. I was in constant pain. I shuffled around the house on my bottom rather than get up and down, went up and down stairs sideways, and could not open jars or cut my food. I had difficulty washing my hair, sitting down on the toilet, getting into cars, and holding the steering wheel. I struggled to keep up with my (by then) 2-year old daughter. My coping mechanism was to divide my day into short increments, between which I would find a private corner, have a mini-breakdown and then pull myself together to carry on. I had no idea how I was going to survive if the pain continued to worsen. For 18 months, I continued to work full-time and be the primary before and after school parent. However, I did not perform any of these jobs well. It took all my will power to get through the basic mechanics of each day. I remember wondering how on earth I was going to make it to age 35, let alone to age 65. My lifestyle completely changed. I used to be very active: cycling and running in the summer, skiing in the winter, walking the dog before and after work. I was not able to do any of these things. At the cottage in the summer (my absolute favourite place in the world), the uneven ground made it difficult for me to get around, I could not get in and out of a canoe, and it was dangerous for me to be alone with my toddler on the island because I could not keep up with her. Something did not seem right about sitting back and doing nothing as the disease spread through my body. I started to do my own research. I read the scientific literature and every book I could find, including Cheryl Koehn’s Plan to Win. Everything pointed toward the need for early, aggressive therapy. Nothing seemed to match what my rheumatologist was telling me. In desperation, I sent an email to Dr. John Esdaile, co-author of Plan to Win, at UBC. The subject line of my email was “HELP”. Dr. Esdaile replied within 12 hours, telling me to see my family doctor immediately and to ask for a referral to a rheumatologist in Toronto. He even provided wording for my family doctor to use on the referral. This is where my story turns around. I had my first appointment with the new rheumatologist within weeks. By that point, I had 37 affected joints, had lost 30+ pounds and had joint damage in my fingers (by MRI) and likely other joints too. The doctor did not want to waste any time trying traditional DMARDs and immediately prescribed a biologic and methotrexate. Biologics, also known as biologic response modifiers, are arthritis medications that treat symptoms and the underlying disease process in inflammatory forms of arthritis, such as rheumatoid arthritis, ankylosing spondylitis, and psoriatic arthritis. The results were miraculous. It took a year and a half for my symptoms to fully disappear, but I am now in full remission and have my life back. 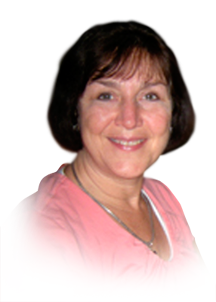 When I was finally diagnosed and started on treatment, my number one emotion was relief. I spent 18 months becoming progressively immobile and experiencing increasing pain. Although I had previously been very healthy and had a high pain threshold (including going through childbirth without drugs), I started to wonder: Shouldn’t I be able to cope better with this pain? Why can’t I pull myself together? Is this really as bad as I think it is? Chronic pain really wears you down and can make you doubt yourself. When my new rheumatologist told me that I was in “very bad shape” and that we need to take an aggressive treatment approach, I felt huge relief. There was a medical explanation for the intense pain and disability I was experiencing – it was “real”! This validation was probably more important to me than hearing that there was something we could do to treat it. I take the actual diagnosis in stride. I would love to better understand the cause and “why me?”. However, I am thrilled to have an excellent rheumatologist who has an aggressive, educated and modern approach to treating RA. I am forever grateful to her and all those who helped me along the way: my husband, my family doctor, my physiotherapist, Cheryl Koehn, and Dr. Esdaile. I just wish I had been more educated from the start and not waited so long to take charge and get that crucial second opinion. My family physician has been excellent. She recognized the possibility of RA within the first month and immediately referred me to a rheumatologist. When I raised concerns about the treatment I was receiving from the first rheumatologist, she happily made the second referral. She feels some guilt that she trusted the first rheumatologist a bit too much and that it was my research that uncovered the fact that we were not on the right track, but she says she’s glad to know about the aggressive treatment option for future patients. I also saw a very supportive and insightful physiotherapist who helped me through some very rough times. She suspected RA from the beginning, kept encouraging me to take my symptoms seriously, and suggested that I get a second opinion. As I’ve explained, I had a truly horrible experience with the first rheumatologist I saw. She had an old-fashioned approach to the treatment of rheumatoid arthritis (her approach was no treatment). This is particularly devastating when you contrast those 18 months with the results I’ve seen under my current treatment program. It turns out that my symptoms were very treatable and those months were a “wasted” window of opportunity. I spent that time suffering with pain and disability rather than fully enjoying a year or more of life with my husband and young toddler, who may be our only child due to medications, etc. Most seriously, this delay in treatment led to permanent joint damage and let the disease progress so far that it’s likely I will be on medication for the rest of my life. The question that keeps me up at night is: How can we educate the general public about RA symptoms and the importance of early, aggressive treatment? My husband is a physician. I have an excellent family doctor. Both suspected RA within the first month of symptoms. Further, I have a science background, know how to search the medical literature, and have access to these resources through my job. Yet, it still took 18 months for me to start treatment. How would someone without these connections and resources recognize the symptoms and get treatment early enough (within 3-months)? How would they know that they were receiving substandard (or at least old-school) treatment? How can we ensure that people don’t waste the window of opportunity for early aggressive therapy and the chance at full remission? There has been a seismic shift in rheumatoid arthritis care over the last 5 years, and I have been very fortunate to ride this wave. Now that I am being well-treated, I have full mobility and energy. I am very thankful to have my life back and cherish every day of good health. My journey was not easy, though, and there’s still a long way to go to make sure that all newly diagnosed patients get access to early aggressive therapy and the chance at full remission. At age 23, life was good: I was recently married with a rewarding career as a radio journalist and an exciting life. So when I developed a sharp pain in my upper left leg and it began to radiate downward, the medical diagnosis from my family GP was sciatica and bed rest. Little did I know that this was just the beginning of a medical journey that would nearly destroy my marriage, change my career, and put me on a path of countless medical appointments over the next dozen years as I sought relief and answers for my pain. The initial pain intensified and traveled from my left leg down to my toes, then ping-ponged from one side to the other. My family urged me to find a solution to the GP’s diagnosis, which was revised to a “non-specific lower back issue”, likely a compressed disc. I walked with a distinct limp when the pain was acute, I slept with a heating pad, I wore a brace that wrapped around my middle for extra lumbar support, and I lived on acetaminophen (Tylenol®). In the pre-Google age, the available research on spinal issues was limited, even though I lived in a large Canadian city. So my quest for information led me to consultations with dozens of medical specialists: back care doctors, neurologists, orthopedic surgeons, physiotherapists, radiologists, sport medicine doctors, rehabilitation services, and yes, even a psychiatrist. Perhaps the pain was really just in my head? Twice I was hospitalized and received cortisone shots in my lower spine and twice, I left the treatment room still in unrelenting pain. Like so many who live with arthritis, I soldiered along. I learned to live with the pain, but there were countless nights when sleeping in an easy chair was the only way to get temporary relief and countless days when the pain would hit without warning in a stabbing attack that lasted for days. There were no big strategies for coping, just the will to keep going, discover the source of the pain, and get relief. I was almost 30 years old when a prominent back care specialist told me: “a pregnancy will cripple you.” I decided that option was preferable to remaining childless. During my pregnancy, for the first time in seven years, I was almost pain-free. Four months after the birth of my daughter, the pain returned. A year later, I was pregnant again and the pain disappeared. Again, only a few months after the birth of my son, the pain came back—with a vengeance. Neither my husband nor I had family nearby, so paid help was our only alternative. A full-time nanny and a cleaning lady provided the much-needed support on days when my parenting abilities were curtailed. I left my full-time job in journalism and began a freelance career working out of the house with a more manageable and downsized career, and less stress. The cycle of pain—and then no pain—was mentally and physically debilitating with its highs and lows, and the unexplained suddenness with which an episode would begin. One day at a client’s office, I was faced with the prospect of climbing a steep flight of stairs, which had become a challenge. My client offered me the name of yet another physiotherapist as a possible solution to my back “problem”. After working with this practitioner for many weeks without any improvement, she recognized that her treatments were not alleviating my situation. She wisely recommended that I seek an opinion from a rheumatologist (the one medical specialty I had not yet seen). I had been suffering for nearly 12 years; I went with low expectations as I had nothing to lose and everything to gain. The rheumatologist listened to my tale of despair and sent me for a single x-ray of my lower pelvis, the first time that any medical doctor had requested this image. He told me to “wait for the result and bring it back to me.” In less than an hour, he confirmed his initial diagnosis: ankylosing spondylitis (AS). You could have blown me away with a feather! Typically AS is found in males with onset usually in one’s early 20s; I was female and the disease had raged—uncontrolled—for nearly 12 years, which gave it ample opportunity to eat away at my sacroiliac joints and ligaments. He gave me literature to read and a prescription for an anti-inflammatory medication. He asked that I return in a few weeks to report on my progress, which he reassured me would be infinitely better. The diagnosis (and anti-inflammatories) provided more than relief: there was a label for my pain and it was not “crazy”. And most importantly, there was a real solution. In the 20 years since that day, with careful medical monitoring and a treatment plan, the episodic pain has gradually ebbed and faded from the forefront of my daily life. At age 55, nonsteroidal anti-inflammatory medications have stabilized me and I no longer watch life unfold from the sidelines. My AS is in remission, but I am aware that as I age I must take care to always be on the lookout for other symptoms of this disease. I monitor my food to see if anything in particular sparks an “attack” (it doesn’t), I never wear heels (well, almost never), I try to get eight hours of sleep each night (five nights out of seven) and I watch my posture (no shoulder slouching for me). I don’t consider myself a hero. I walk the dog every day, although a flare up in recurrent plantar fasciitis, linked to my AS, slows me down occasionally. I travel, but still bring along a heating pad—just in case. I’m looking forward to the start of a yoga class to ensure that I remain flexible over time. I pray that my grown children dodge the genetic bullet and the destruction to body and soul that undiagnosed AS creates in its wake. I take my anti-inflammatory medicationss religiously and have added a herbal supplement (with my doc’s blessing) to the mix to combat inflammation. I know that in the future I will likely need to migrate to the new array of biologic treatments to fight the disease. Mine is not a herolike existence, but I am back to the business of enjoying life. My story? I haven’t given much thought to sharing “my story” before but I have a perspective on this disease I would like to share with others. I believe life with this disease is about decisions and attitude. I have been in this relationship 45 years and there have been tough times and good times, but always I have fought for control in the relationship! I haven’t always been on the winning side, but I wasn’t going to be a pushover either! It all began one morning when I was 16 and I woke up with a swollen wrist and unable to bend it up and down. My mother rushed me to the doctor and very shortly thereafter, I was told I had rheumatoid arthritis. I had heard of arthritis but thought it was a disease old people got, not a 16 year old. My parents were upset and concerned, I on the other hand as a teenager, thought “so what?”. In retrospect, we can trace minor symptoms back to age 12. Immediately they prescribed some pills (indocid and prednisone) and in a short time I was doing better and I felt fine. Then, 3 months later the disease came back to life with a vengeance and attacked every joint in my body. My doctor in the small town of Powell River made the decision to hospitalize me, where I stayed for 2 months. My time in the hospital was difficult to say the least. My grandmother was admitted and died of cancer. During the same period my sister gave birth to my niece. Through these big events, I struggled to get better. I was somewhat of a celebrity as the high school I attended made every effort to ensure I wasn’t isolated. My friends came to see me, and even some people I didn’t know well came to see me! A friend who was on the New York Yankees farm team sent me a baseball signed by all the farm team members. I had daily physiotherapy and I was not allowed to bear weight on my joints so I was wheelchair bound. I stopped eating, which was no surprise since the hospital food in 1966 was not something any teen would enjoy. My doctor was so invested in my health that he told me to order what I wanted and when I said I wanted steak, I had steak the next night! I was fortunate at the time of my diagnosis that the internist who took over my healthcare from the GP had a mother who suffered from rheumatoid arthritis (RA) so he had researched the disease and was current with the latest treatments. I credit those early days and the limited damage in my joints to his knowledge and dedication to my health. I continued to have an “I have arthritis, so what!” attitude as time went on. I chose to ignore all the possibilities of how bad it could get and focussed on how I could get back to my normal teen life. I was released from the hospital in August in a wheelchair, and when school resumed in September I was ready to go back. Over the summer I had earned my driver’s license, which gave me great freedom. I completed the year with a reduced course load and loved the fact I did not have to take P.E. (gym) anymore. As it turned out arthritis did have some benefits! By my Grade 12 year it was hard to tell I was any different from anyone in my peer group, but everyone knew I was. This is the period I made the decision to ignore and minimalize my situation. I didn’t want to be different and felt I could do anything I wanted to take on . . . and I did. After graduation I took a job at a radio station and enjoyed a long period of remission. I moved to Vancouver for a year and at the age of 21, I decided to travel to Europe with three girlfriends. It must have been very difficult for my parents, but they supported me and off I went. We spent four months hitchhiking around Europe. I walked a lot, I learned a lot, and I grew up a lot. Arthritis took a back seat in my life for many years. I met my husband, we married, and moved to New Zealand. Arthritis attacked again but I managed it with Aspirin® and once we returned home it went into remission and I was back in the driver’s seat with no medication. By 1983 we had two children and had endured a financial crisis that saw us lose everything in 1985 due to the 1981 overnight interest rate spike. Again my health took a dive, but with young children to care for, I just kept on, keeping on. My kids needed me and I hated the fact that this disease was attempting to control my life yet again. Some days I gritted my teeth through the pain and other days I stood at the sink washing dishes with tears rolling down my face. Coping was not always easy but it had to be done for the sake of my family and myself! To rebuild our lives and our finances we moved back to New Zealand, and from there to Western Samoa. During these three years, arthritis worked hard to control me, but I fought back, dabbling in naturopathy and reading every self-help book I could lay my hands on. The naturopathy diet managed to reduce my weight to a level that I was convinced I had cancer. I stopped the diet and thankfully gained some weight back, which alleviated the additional health concern. Through all this, I did not seek the help of a rheumatologist. Why you might ask? All I can say in response is that I was determined to win the battle with this disease and I felt the answer was within me somewhere. We came back to Canada for Christmas 1988, rented a house in Richmond, and our two children began school. I took a job at a travel agency and after working a year, advised the owner I needed to take some time off: I was exhausted and my joints were making walking and moving too difficult. He not only gave me the time off, he kept me on the payroll and said to take all time I needed. After one month, the manager called me and asked if I would go to a training session in Dallas with her. I agreed. While I cannot explain it, my arthritis started settling down and I was beginning to feel better. Soon I was back to work and had my sense of control back. The period between 1989 and 1999 took me down many different paths mostly in the realm of self-help. I was still convinced (and remain so) that my beliefs, thoughts, attitude and ability to have control over my life directly impacted the severity of the RA symptoms. When I felt my life was in balance I was able to completely go off any medication but inevitably, there would be a change in my life balance and the disease would attack, letting me know it was still there . . . lurking. In 1999 my husband and I ended our 28 year marriage. Once the decision was made (it was very amicable on both sides) I began to feel much better. Our children were 18 and 16, still living at home and reliant on me to support them. Then in 2002 my mother began showing signs of dementia so I moved her in with us. We lived with her dementia for five years and during that time my health steadily declined. Finally, it became impossible to care for her adequately so I made the very difficult decision to place her in an intermediate care home. Nearly five years later, Mom is still there. At first managing my guilt was a challenge, along with how often to visit. The environment is not the most stimulating or uplifting, but I am now comfortable visiting the home five days a week and I am now involved in the Family Council and the Auxiliary, filling the secretarial roles. While Mom lived with me I reconnected and developed a new relationship with a former high-school sweetheart. We have been living together for four years. I am both content and happy with my current life and what the future might hold. My life is full. We go sailing in the summer, and have large family dinners with our combined family of five adult children, along with their significant others, and our exes. Also, after approaching the amazing organization, Can Assist in Victoria, I now have a modified bicycle that lets me complete a revolution on the pedals and go for rides along the dyke. I have finally made the difficult decision to commit to taking a “biologic” medication. I tried two different ones for brief periods but felt no benefit. This next one is expected to give me better results and enable me to get off the dreaded prednisone. Once I am off the steroid medication, my focus will be to go for long periods without another “infusion”. Most of the medical professionals who have dealt with me over the years would probably define me as difficult and/or stubborn, although not all have this opinion. I suspect those that do view me in this way resent the fact that I question everything. My goal is always to come off the medication of the day. With so many years living with this disease, I am always seeking a partner in my healthcare, not a dictator. I have refused to go back to some doctors I have encountered over the years because I will not be put in the “RA” box and not be heard. I realize the doctors have extensive scientific knowledge of the disease, however, I have extensive knowledge about how it manifests itself in my body. It is that perspective I have fought to get across all these 45 years and I am pleased to say that with both my current GP and rheumatologist I feel heard, and they respect and consider my input. Bonnie was first diagnosed with psoriatic arthritis at the age of thirty-four and has been living with the disease for thirteen years. Early on, her family doctor ordered a blood test, which showed no rheumatoid arthritis, so the possibility of another type of arthritis was not considered. 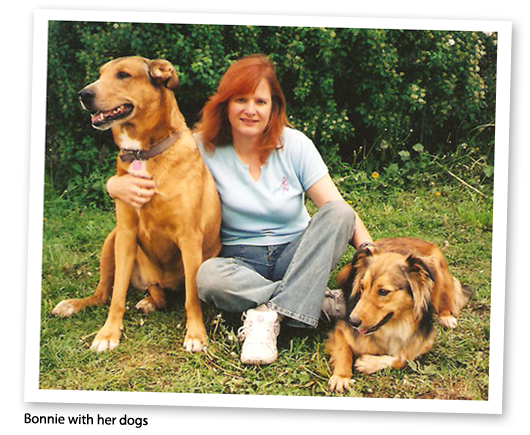 Bonnie, however, with swollen toes and knee pain was sure she had arthritis. Frustrated by knowing that she needed treatment, but was being denied access to it, she asked her dermatologist to insist the family doctor provide a referral to a rheumatologist. The rheumatologist told Bonnie she had arthritis in every joint in her body. After a year long process, it was a relief to finally have a diagnosis, but she also found the news depressing. Because there is no cure, she knew she would be living with the disease for the rest of her life. Knowing that it could debilitate her and take away some of the small pleasures of her life, she shut down a little. After being told that exercise was hard on her knees, she stopped. She gained weight, but that made her arthritis worse. It took her four years to come out of that, and start exercising again. She began by walking, and walking, and walking some more. She lost 35 pounds and was feeling good about herself again. During this time, she was put on arthritis medications and started taking dietary supplements. 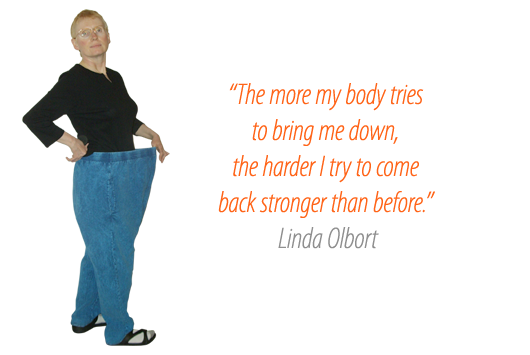 The medications helped her get back into exercise. Though she wishes she did not have to take medications – she hates the constant blood tests to make sure there is no kidney damage – they keep her mobile. Physiotherapy and acupuncture also help, and yoga has been improving her flexibility. When she lost the weight, she decided to do something bigger to fight arthritis . . . on a bigger scale than her personal fight. She started fundraising for arthritis by running. 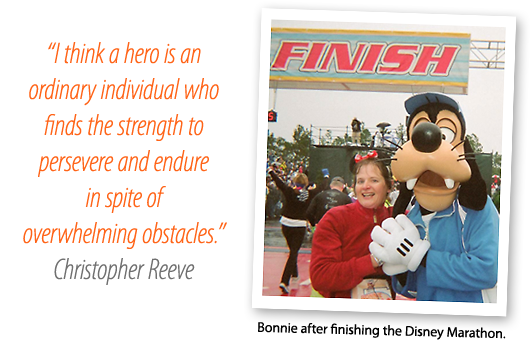 First she completed the half-marathon at Disney World, which she loved so much it spurred her to do more. She did a full marathon in Athens, Greece and then the Goofy Challenge at Disney World (a two day event with the first day being a half-marathon and the following day a full-marathon). What’s next for her? She has registered for a five day cycling event in Provence to raise more money for arthritis. Bonnie is very proud of herself, with good reason.